For June's First Friday in Fort Collins, CO, BERK VISUAL participated in a group show called "Grinders Hold The Beef" at The Luscious Nectar with local artists, Page of Gumba Crew and Scotty Roebuck. The three artists had a collection of paintings on display and collaborated on a live painting during the show. The painting is up for big online until July 1. You can make a bid by posting directly on this Facebook post. Kanrocksas music fest kicks off this weekend in Kansas City with A Perfect Circle, The Black Keys, Eminem, The Flaming Lips, STS9, Bassnectar, Major Lazer, and many others on the line-up. The festival will also host a list of visual artists to paint live and contribute to mural space. 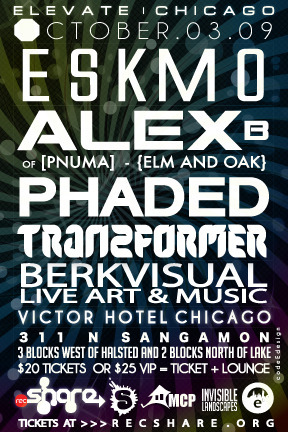 Our own BERKVISUAL will be there keeping things raw, so keep an eye out for this guy while he paints live with STS9 and Paper Diamond. Chicago- check out some dope music and live art going down in The Victor Hotel at the West Loop Lounge on Saturday October 3.